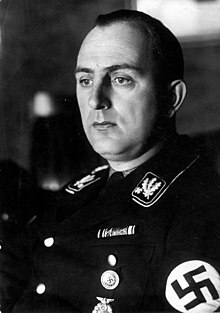 Kurt Daluege (September 15, 1897 – October 24, 1946) was an SS-Oberstgruppenführer and Generaloberst der Polizei, officer of the Central Reich Security Office (RSHA) and the governor of the Protectorate Bohemia and Moravia. In May 1945, Daluege was arrested by U.S. troops in Lübeck and interned at Nuremberg until September 1946 when he was extradited to Czechoslovakia. Kurt Daluege was hanged at Pankrác prison in Prague on October 24, 1946 after having been found guilty by a Czech court of war crimes in the Czechoslovakian states. He was buried in an anonymous pit at Prague's Ďáblice cemetery. After receiving a promotion. Quoted in "The Pursuit of Crime" - Page 129 - by Ronald Howe - Police - 1961. This page was last edited on 26 January 2019, at 14:05.